This is one of those old timey blog posts in that I bought this product, I like it a lot and I wanted to tell you about it. 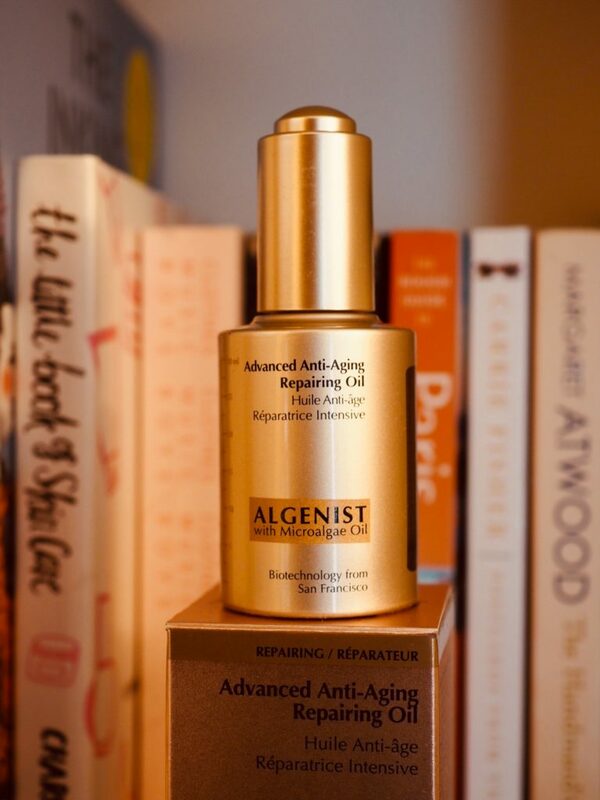 Say hello to my new skin hero, Algenist Advanced Anti-Aging Repairing Oil. To be honest, I nearly didn’t buy this product because it’s got the dreaded ‘anti aging’ tag on it. As I’ve said before, I don’t like this term because of its negative connotations: that aging is a terrible thing, to be avoided at all costs. I do think that skincare companies are starting to look beyond this term and realise that it’s a turn off for some consumers. Look at L’Oreal and their Age Perfect range for how to do it better. But it will take time for anti-aging to be consigned to the linguistic dustbin where it belongs. And in the meantime, if you are over 40 and shopping for skincare, anti-aging is mostly all there is. 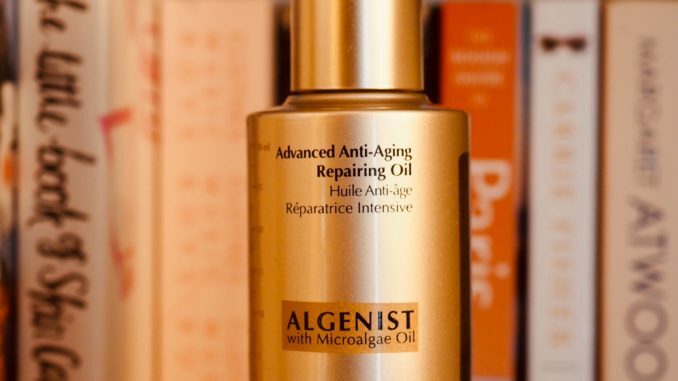 I had tried a sample of Algenist’s eye cream and I thought it was excellent, so that’s what led me down a rabbit hole where I discovered Algenist Anti-Aging Repairing Oil. Throw in a little spare birthday money, a special offer at SpaceNK, and before you know it this stuff is on my face. I’ve been using it for about 6 weeks now. First of all, this is an incredibly light oil. If you’re put off facial oils because you think they might be greasy, this is the exact opposite. The texture is a lot like Dermalogica’s wonderful Phyto Replenish Oil. It absorbs straight away, leaving everything smooth and feeling well-nourished (I sometimes add another serum on top for added hydration). It gives a nice glow to the skin and sits well under make up. The key ingredients here Microalgae Oil, ceramides and brown algae extract. Algenist specialises in plant algae-based products, so this is their USP. And no, it doesn’t smell bad with all that algae in there. It doesn’t really smell of anything much. And can we get a little appreciation for the lustrous gold packaging? I especially like the dispensing button embedded in the lid. There’s something very satisfying about using it. A little bit goes a long way, and as you only need 2 or 3 drops at a time, I would expect this 30ml bottle to last 4 to 6 months. If your skin is very dry then you might prefer a heavier oil, but for normal to oily skin then I think this is a great choice. Algenist Anti-Ageing Repairing Oil is widely available from sites including Look Fantastic and Amazon. RRP £65 for 30ml. I bought it from SpaceNK when they were having one of their £15 off deals, which they do around twice a year, so I paid £50.